Thank You, please dirve through. You must be using IE 3.0 or higher to ring up your order. Local Sales Tax :   Place in decimal format. Prices may vary. Not all items available in all areas. 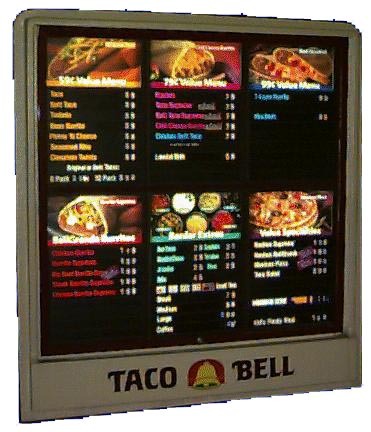 Menu selection taken from Tampa Bay Area Taco Bells, 6/97. You must be using Microsoft Internet Explorer to view this page since the menu selection is written in Visual Basic. Contact Jelloboy to get the answers.